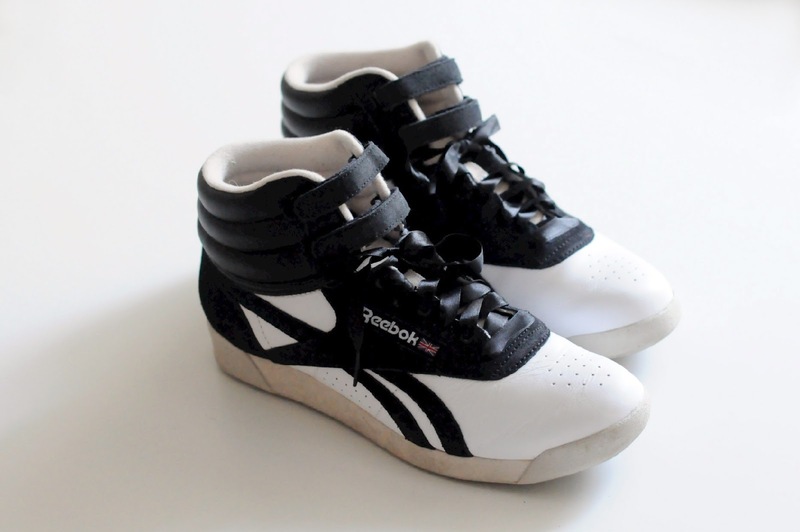 I wrote about my love of hi-top sneakers a while ago, and since then I’ve been thinking about the Reebok Freestyle, that staple of the 1980s. Remember? When I mentioned them on Twitter, Natalie said they were like walking on marshmallows, and I think she’s right. I got pretty excited when I found that you could customize your own pair. It seemed like a fun thing to try, and with parts called “Puff 1,” “Puff 2,” and “Puff 3” it really was fun. The pair I ended up customizing are not flashy and colourful in the slightest. They could have been, though. I had the Isabel Marant Bekket sneakers in mind at the time, so I was aiming for a similar feel, although a little more budget-friendly and old school. The taupe colour wasn’t quite as dark as I had hoped it would be (the sole and the inside lining are taupe), but I’m pretty happy with them! I am going to wear them with maxi skirts this summer, à la Susie Bubble. I think I look pretty dorky in hi-tops but whatever. They still are like walking on marshmallows! See you, me, and Julio down by the basketball court! I recently finally saw I Am Love, a lavish and intensely beautiful film that I had been meaning to see since it came out. In a movie filled with enduring imagery, the one image I haven’t been able to shake off, beyond the incredible opening title sequence, is one of Tilda Swinton’s character standing in a bathroom fully covered in marble. I just really love marble! This morning I quickly calculated how much money I have saved on subway fare since I’ve had my bike, and it’s already halfway to paying for itself. Well, that isn’t a totally accurate figure since some days I would have walked, and I have my old bike which was probably not safe to ride without major work, but still! I have been enjoying it. It didn’t have so much as a bell when I got it, so I added a few accessories. I took this when the hawthorn was blooming in the backyard. Glamour shots! I love the white walls of the tires, even if they are a bit dingy, and the chrome chain guard. We bought an inexpensive rack, $15 at Canadian Tire, and Geoff affixed this wine crate we had to it. I know this probably looks heavy, but it isn’t that bad and it fits my giant purse and my lunch. It would probably fit a few stray kittens too. So yeah, it’s been renamed ROAD KITTEN. I got this light for the front (no one is surprised that I got one with the word “cat” in the name), and this one to attach to the rear fender. I would like to upgrade the saddle at some point, but I think I have everything I need for now, including a pretty good lock, pump, helmet, and container of oil. Even though I love my bike, I couldn’t help but keep a mental list of dream bikes when I was looking for one of my own. 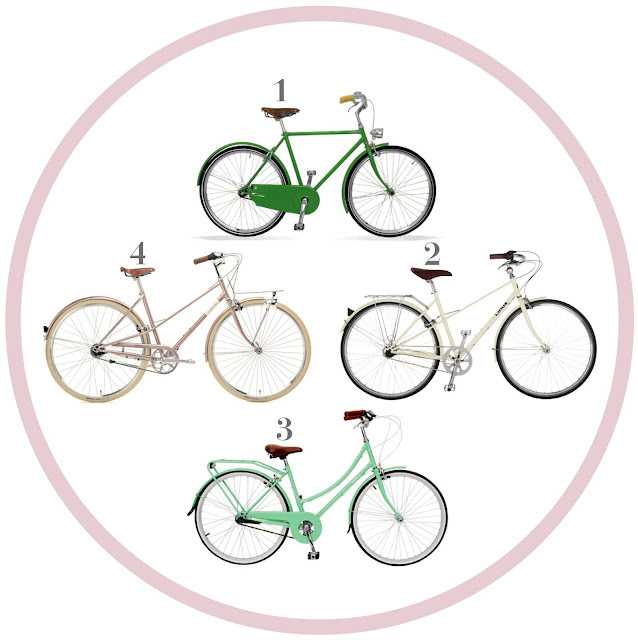 These are all so super cute (keep in mind that I am not a bike expert. I like these for their aesthetics and have not tested them, although I am sure they are comfortable to ride around a flat city at a moderate pace). They will have to remain in my dreams of paved country roads lined with wildflowers, however. I like bikes that are smaller in size, and the mixte frame is my favourite. Some of the huge Dutch-style bikes are just too much bike for me, personally, as beautiful as they are. Click to view large: 1. Abici Primavera in verde (I also like the Sveltina, but I love the green colour, name, brown saddle and grips, and chain guard of the Primavera), 2. Linus Mixte 3 in cream, 3. Bobbin Bicycles Birdie in mint green, and 4. Creme Cycles Caferacer in pearl pink doppio (aahhh!). All these brands but Creme Cycles are available in various bike shops in Toronto, so I have visited the other three and looked at them longingly. I am pretty sure that Linus is the official bike of my neighbourhood. If you are looking for a restored vintage bike, Toronto Vintage Bikes does beautiful work. Or buy an old beater and take a workshop at Bike Pirates!